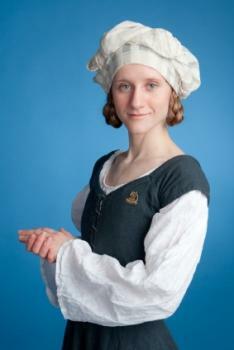 A peasant costume is easy to make! If you want to capture the look of a bygone era without parting with significant cash, you may wonder how to make easy medieval costumes. Although many medieval costumes evoke romance and royalty, simple peasant costumes are just as appropriate and are easy to create on a budget with minimal sewing or craft skills. Get inspired with these ideas for how to make easy medieval costumes. Unless you plan on participating in a fair amount of medieval themed festivals or events, a costly costume may not be a feasible option when in need of a medieval frock. Thanks to their rich details and fine textiles, authentic medieval costumes are some of the most expensive to construct. If you opt for s store-bought costume, you can expect to pay top dollar for a well-made suit or gown. A traditional medieval gown may consist of several layers of velvet and lace details, beading at the bust, and an abundance of ribbons and underpinnings. Male medieval costumes are traditionally just as layered and ornate and may include pants, white fancy collared shirts, and velvet or leather vests and jackets. While their cost may hinder many people from buying authentic wear, there are plenty of ideas to create the same look simply by raiding resale shops and reconstructing salvaged pieces. Creating medieval costumes can be an expressive and creative outlet that can also serve as a unique hobby for those involved in the Society for Creative Anachronism. The styles of medieval dress were dictated by the social class of the wearer. Here are some ideas to reconstruct an authentic and affordable medieval character. The poor working class of the medieval era were known as the Serfs. Serfs worked in the mining, forestry and craft industry and were the poorest of the medieval people. To create a serf costume, focus on designing an ill-fitting, sloppy frock. A large piece of burlap tied around the body shapelessly will suffice. To secure the burlap, a thin piece of twine can be affixed to the waist. While you can go barefoot for the most authentic reenactment, a strappy pair of leather sandals will work should footwear be needed. Make sure hair is unkempt and disheveled and rely on black face paint to create a dirtied appearance. While the peasant folk were more fortunate than Serfs, they were still a world away from the royalty of noble men. A typical peasant costume for women includes a white gauze peasant top, a black corset style vest and a long broomstick skirtin earthen colors. Hair should be worn in messy braids or held back with a scarf for added adornment. Men seeking a peasant look should opt for white gauze shirts or tunics paired with tight britches or brown leggings. If you can find a tie-front suede vest, you can layer it on top of your tunic or shirt and pair it with coordinating well-worn work boots. For those that crave an elaborate design, a noble costume is the best medieval option. Women should scour thrift stores for long velvet gowns in a variety of regal colors such as royal purple, deep blue, or burnished gold. No need to focus on small details, you can always add a bit of lace or ribbon with a hot glue gun or with a few stitches. Hair should be very well groomed and styled away from the face in a braided design. Corset details and full petticoats will help construct your shape. A small gold or chain circlet worn on the crown of the head will add a noble touch. Men who have opted for a noble man suit will need to invest a bit more time finding their essential garments. A black pair of velvet leggings or pants should be paired with knee high suede boots. Try to stay within the dark rather than brown color family to continue your classic look. A long white gauze shirt should be worn under a long velvet sleeveless tunic. You can add faux-fur trim to your tunic with a hot glue gun or a few stitches to create a more elaborate design. A crushed velvet hat should be worn to adorn and finish your look. A gold sash or rope belt can be swung around the hips for added design detail. Once you've decided which social class you want to represent from the medieval era, design ideas are endless. You can get as crafty or as basic as need be to construct your own medieval frock. Keep in mind your class and gender and let your imagination run wild! Once you've learned how to make easy medieval costumes, you can use your skill for a unique Halloween costume or any other enchanting dress-up event.